Utagawa Kuniyoshi (1797-1861) Sixty-nine Stations of the Kisokaido: Warabi Station - Inuyama Dosetsu, 1852. Oban. One of Kuniyoshi’s most striking designs, showing him at his most dramatic and his most innovative. A tour-de-force of design, colour, drama and mystery, the print emphasises how fresh was Kuniyoshi and how original and flexible was his imagination. Time and again in prints from the mid to late nineteenth century, one is reminded how so many iconic images by other artists such as Yoshitoshi or Kunichika have their genesis in an original piece by this great and masterful artist. This series of the Kisokaido was a response to the increased demand for mitate, or puzzle pictures based around travel. Censorship that forbade all actor portraits and proscribed many historical figures did not apply to the types of travel picture made popular by Hiroshige in the 1830’s. Kunisada started a craze for these travel pictures that happened also to feature actors or other subject (usually unnamed). Kuniyoshi was much less of a theatre artist than Kunisada and his ‘travel’ series tend more to play to his strengths as an illustrator of myth and legend, as is apparent in this print. We see Dosetsu, one of the eight dog heroes from the long and immensely complex, 106 volume epic, the Hakkenden. He is gifted with fire magic and earns his living as a magician. He travels through vilages walking through fire in exchange for offerings. 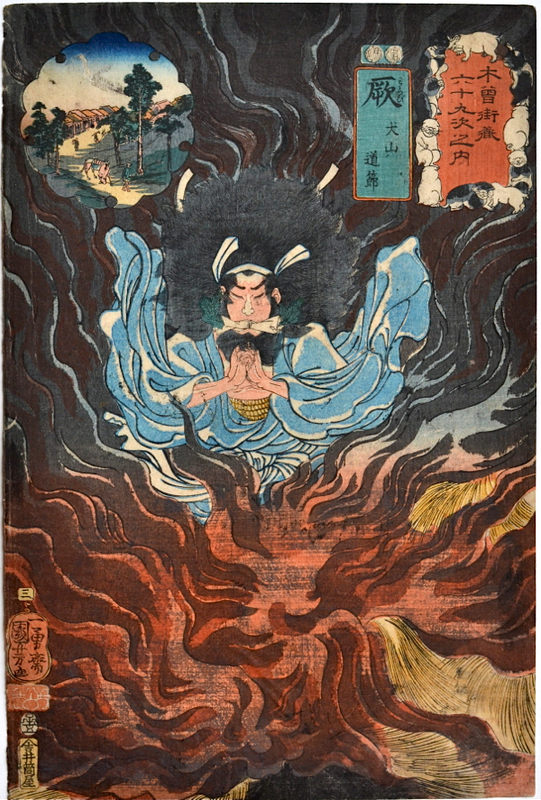 The place name, Warabi is also a pun on ‘straw fire’ which Kuniyoshi depicts amid the roaring flames. 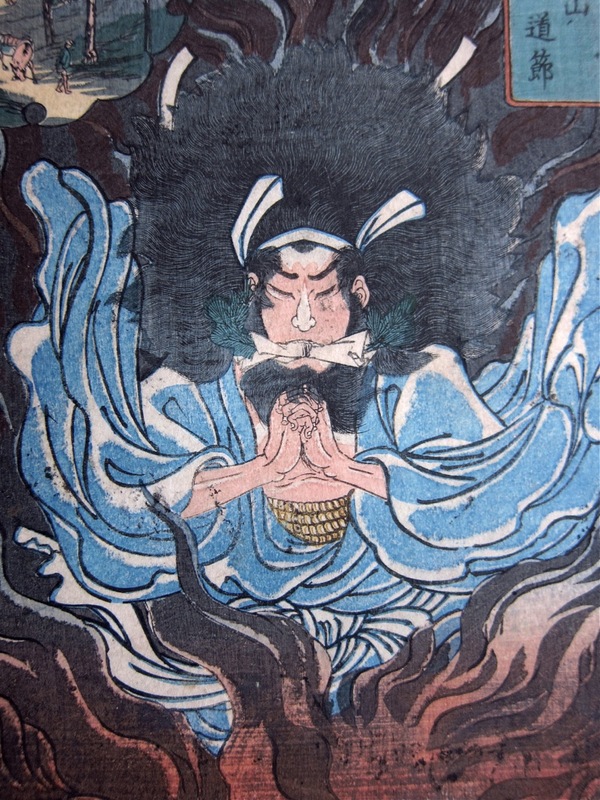 He is dressed in the white robes of an ascetic and holds a pine branch wrapped in an incantation between his teeth. The left hand cartouche shows the village setting of the chapter whilst puppies (a favourite of Kuniyoshi) decorate the border of the right hand cartouche. A great print, colour, condition and impression are all fine, the finest print in the series by far.